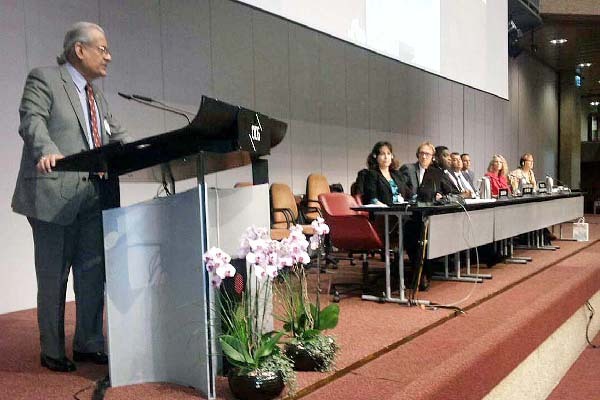 Delivering a key note address on Parliaments as early responders to Human Rights Abuses at 135th Inter Parliamentary Unions (IPU) annual session being held in Geneva, he said, a dialogue among civilizations should replace the clash of civilizations, said a message received here. He called upon the world community to focus on effective and timely implementation of the existing international human rights covenants, treaties and international laws and coordinating a prompt, uniform and collective global response to check systemic and enduring human rights abuses in the initial stages whether being perpetuated by states, non state actors or terrorist elements. Senate Chairman urged upon the world parliamentarians participating in the session that the West must also shun their destructive war economy approach which strategically thrives on wilful creation of chaos and instability leading to conflicts nourished by weapons produced in trillions of dollars worth war industry, to keep its economy afloat while the rest of the world drowns in misery. Underscoring the need for adopting a uniform and non discriminatory approach to human rights abuses and violence, Mian Raza Rabbani said that a terrorist act and ensuing carnage must evoke same sentiments of pain and loss for all the human being without discriminating on the basis of language, colour of skin. Mentioning duality of standards of western powers that Pakistan has witnessed in support of dictators rules in the country, he said that the West’s claims to support the democracy and human rights has been exposed time and again. He stressed that curbing legitimate peoples struggle for rights, civil liberties and freedom with brute force by using pallet guns, as in Kashmir, or by reducing bustling neighbourhoods to rubble, as in Palestine and Syria, using the smoke screen of fighting terrorism is wrong. Dubbing freedom fighters as terrorists to falsely justify killing them will trigger more violence and aggression, creating a vicious circle where there are no winners. He said that lack of timely and adequate action on part of states, international community and multi lateral forums such as UN to check human rights violations have often led to eruption of full scale violent conflicts destabilizing the whole region and shattering peace so vital to development and progress. Kashmir, Palestine, Iraq, Syria and other parts of the world have exposed the inadequacies and shortcomings of the UN and its relevant bodies such as the Security Council and Human Rights Council, as well as International Court of Justice and other multilateral forums like the IPU and the Commonwealth Parliamentary Association (CPA) to this effect. He said that the longstanding Kashmir issue is a case in point. This dispute is the oldest unresolved international conflict on UN agenda. The continuing human rights abuses and denial of Kashmiri peoples right to self determination and plebiscite as per UN resolutions has made Kashmir issue a flashpoint and a major source of instability in South Asia. The current agitation in Indian Held Kashmir is rooted in the struggle of the people for the exercise of the right of self determination, he added. women and children have been killed and wounded by use of inhuman tactics such as pallet guns whose use may be crueller even for animals they are originally meant for. He said that the parliamentarians must take a lead in upholding the rule of law by ensuring that domestic legislation is compatible with constitutional and international human rights obligations. existing legislation where necessary, he maintained. He said we must workout suitable mechanisms and also muster necessary political will to mainstream parliamentary diplomacy in both national and international HR protection agendas, which is otherwise considered the exclusive domain of the executive branch of the states.